I often want things that don't exist and that is a big motivator in being a crafty gal. If I can't find it, I make it. 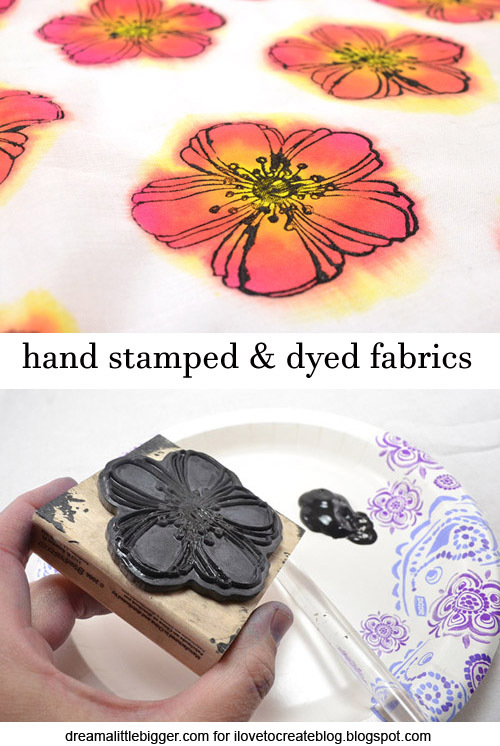 And when I was envisioning some fabric for pillows that was white, with red poppy-like flowers and couldn't find it, I decided to hand stamp and dye some up for myself! The process is really easy, tons of fun and quite rewarding! 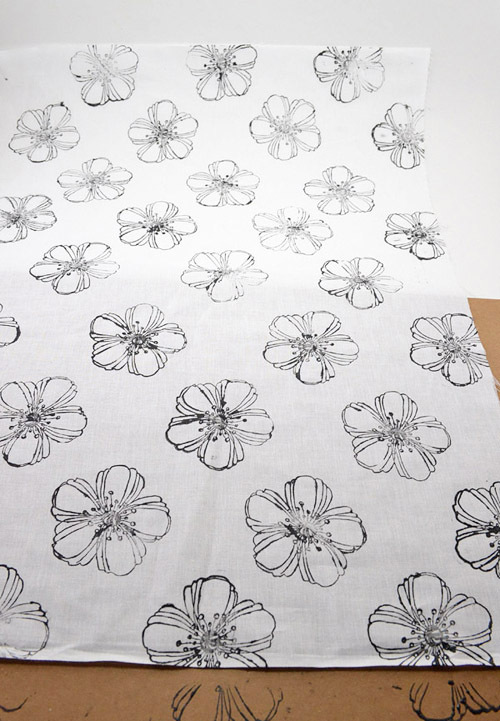 Grab your supplies and let's get ready to make some custom fabric! 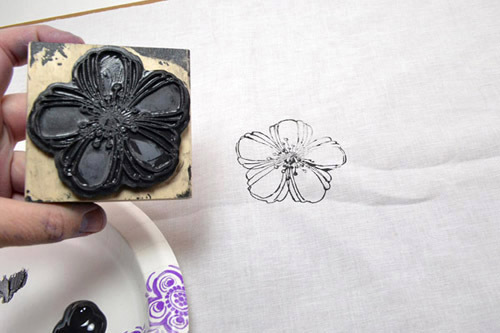 A rubber stamp with a deep pattern works best. Using your brush apply a small amount of paint onto the raised parts. You'll get some elsewhere but do your best to keep things neat. 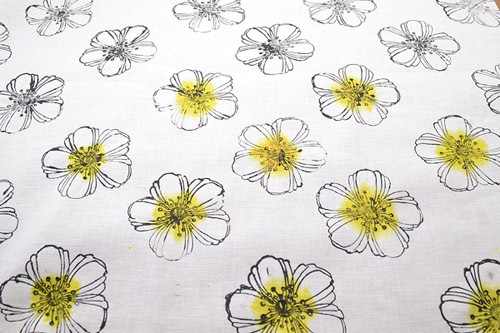 Make sure your worktop is nice and even and then place the stamp directly onto the fabric and push down. Lift the stamp straight up. If you don't your stamp will smudge. And definitely feel free to practice this on scrap before you take on the big show. 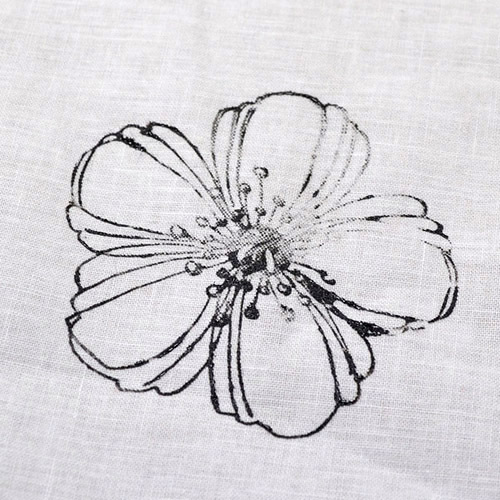 Your stamp won't be perfect in all places but that lends to the charm of the fabric. The neatest thing about using Tulip paint is that the lines the stamp makes are raised. It feels so neat! 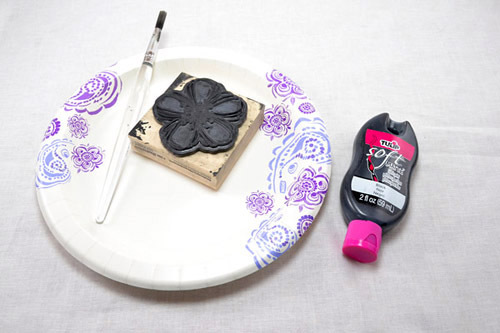 Continue stamping in your pattern and occasionally wash your stamp to get rid of any paint that accumulates in the cracks. 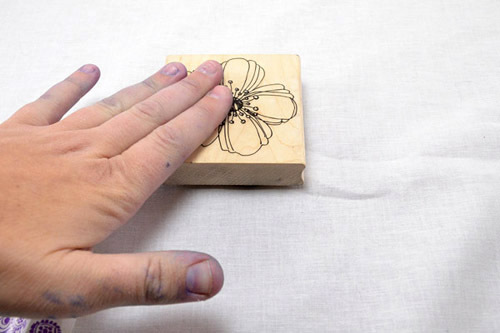 That paint will start to make your stamps fuzzy looking and the lines less crisp. Until you have your swatch fully covered. Mix your tie dye as you please, or use left over. 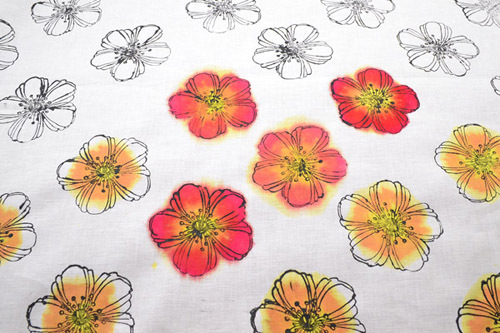 Start with your first color and paint directly onto the fabric. If you want the colors to really bleed together, move onto the next color before the first dries. If you don't have a color you need, make it! I mixed my yellow and red to make the perfect orange! I wanted my colors to bleed and color "outside of the lines". 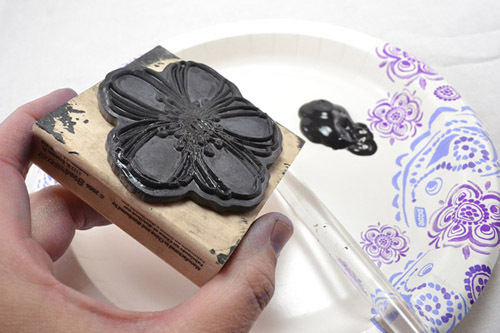 If you don't you can take some Tacky Glue and go around the outer edge of your stamp where you don't want the dye to go. 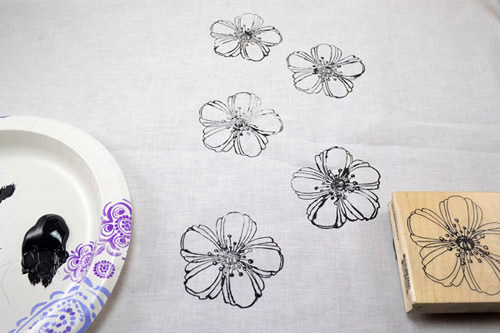 This will act as a resist and keep the dye within the stamp. The glue will easily wash off in the washing machine when done. Can you tell how the edges of the paint are raised? 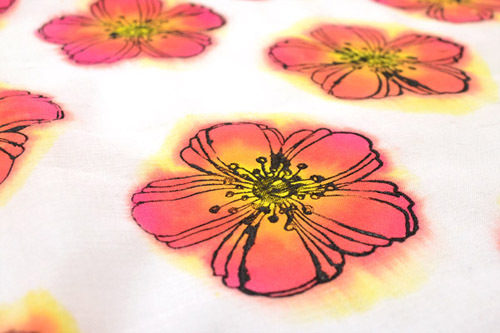 After washing out my fabric the colors became more faint, but that is the way with dyeing. I only let me fabric sit about 3 hours before washing out, longer would have also added to the darkness of color. 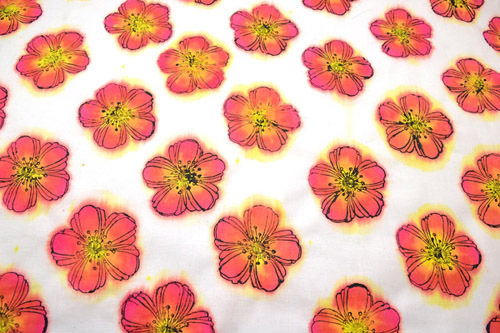 For this swatch of fabric, that I envision being a Euro sized pillow, I stamped my pattern and then came along and dyed with a paint brush and mixed colors to the desired look. See how it goes from blue to teal to green to yellow green to yellow to orange to red? I LOVE it! 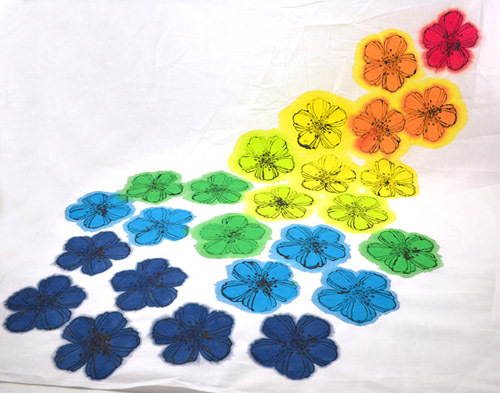 I wanted these to really, really bleed, and in fact I was hoping that the color would spread out beyond the flowers to bleed together and mix but that didn't quite work out. I'm still happy with the results, though! And that is a thing to remember, when working with dye things may not turn out exactly as planned but it's always awesome anyway! And there's my main even again. Isn't it lovely? All in all about half a yard took me around 2 hours to complete, with dry time for the paint included. Placed in front of the TV and a few episodes of The Paradise and time flew by! I hope you liked this tutorial and I also hope to see you over at my blog Dream a Little Bigger. Until next time! 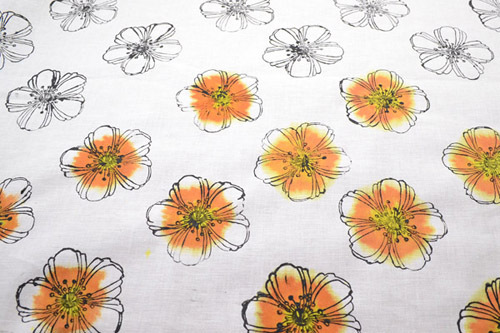 Can I use acrylic paint and fabric medium for this? Will it stay? superb and impeccable post.I appreciate you for this information.